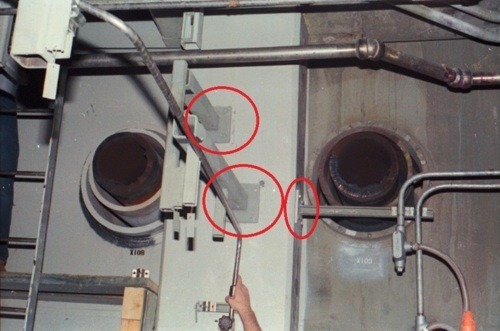 In late 1986 or early 1987, workers discovered irregularities in the construction of the building housing the emergency diesel generators at the Brunswick nuclear plant south of Wilmington, North Carolina. The building was designed to withstand an earthquake. Numerous bolts, including drilled-in anchor bolts and masonry wall through-bolts, were used to “lock” the iron framework and concrete columns together into a robust structure. The workers reported various problems with how the bolts were installed to hold the building together. The figure below illustrates bolts and supports similar to those used at Brunswick. For some reason, the concerns went unresolved at the time. In April 1992, NRC inspectors reminded the plant’s owner about the matter. The ensuing investigation confirmed numerous disturbing facts. In some cases, bodies had been cut off bolts with the bolt heads then simply welded onto supports. This would be like cutting the head off a nail and gluing it to a piece of wood rather than using the entire nail to join two pieces of wood together. Many other improperly installed bolts were discovered. On April 21, 1992, the plant’s owner shut down both units for what was expected to be a one week outage to fix a few problems. Both reactors remained closed more than a year while these problems, and several related ones, were corrected. The improperly installed bolts and support may have allowed the emergency diesel generator building to collapse had there been an earthquake or a hurricane. The emergency diesel generators probably would have been broken by the building’s collapse. Since the normal power supply for the plant may also have been disabled by the earthquake or hurricane, the building’s collapse may have left the plant without any power except that from batteries. Plants like Brunswick are designed to survive on battery power for only a few hours. It would have taken considerably longer to repair crushed emergency diesel generators. The NRC issued operating licenses for the two reactors at Brunswick in 1974 and 1976. How were such gross construction problems in a vital building overlooked for nearly two decades? Once identified in 1987, how were the problems ignored for five years? The more important question to answer is “do any other construction and design errors remain undetected, and uncorrected, in U.S. nuclear power reactors?” For while the problems at Brunswick eluded detection for nearly two decades, at least they were found and fixed before some event exploited them and caused a nuclear disaster. It’s never too late to correct a nuclear plant safety problem. Unfortunately, it’s also never too late for nuclear plant safety problems to factor into preventable disasters.